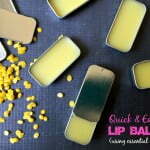 A quick and easy recipe to make your own lip balm with essential oils. Only 3 ingredients and you can make this in minutes. Fun to do with kids too! Put a couple spoons in the freezer before starting. Add your coconut oil to a glass measuring cup or a container with a spout and preferably made of glass. Add your beeswax beads starting with a 1/4 oz. (You will add more if you want the consistency to be harder). Microwave in 30 second intervals and mix in-between until the beeswax is melted. The time will vary depending on your microwave, the amount you are making and the carrier oil you use. Mine took 90 seconds then I added more beeswax for another 30 seconds. Mix well until all the beeswax is melted. Pull out a spoon from the freezer and dip into the mixture. Test the consistency and if it's to your liking it's ready. If not, add a bit more beeswax and continue to microwave until you reach the desired consistency. Add your essentials oils and mix well. Pour into containers and let cool and harden.